Home > Blog > AUTHENTICITY of a WEBSITE – A 52 points updated checklist of 2017! 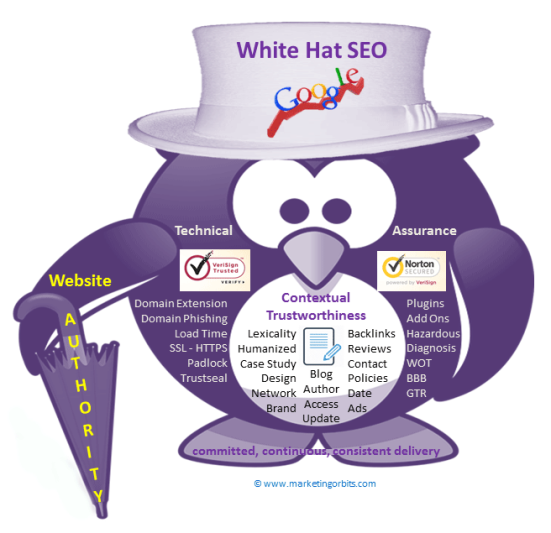 A trustful website with technical assurance is like a gentleman in suit-boot! How to measure the popularity and trustworthiness of a website or webpage? How to determine the user likeliness of a search engine result page (SERP)? How authoritative a webpage is? What is the credibility of an internet website? What is the goodwill of a website, blog, webpage, landing page or targeted page? …………. and more similar questions! Presumed Credibility – a known brand is more credible than unknown or new one. Reputed Credibility – recommended or referenced by friends or closely knowns. That the website is moral, law-abiding and cares about its customers. That a product from the website will do what it claims to do and will live up to its claims. That the people trust that when they hit the ‘send’ button, an email will be sent to the selected contact. That information provided on the site will be correct, complete, and unbiased. That a website will protect my personal information given and shall keep it private. After understanding the importance of being authentic, let’s talk about context of our subject. If user intent is transactional, they shall be extra sensitive about security and safety of their money and quality of item purchased or downloaded. If intent is informational they will look for contextual content from a credible source; primarily the one with peer reviews. If intent is navigational user would have a presumed impression of their target in advance e.g. a particular website, and due to this user would had limited choices but still a high quality and credible content would be appreciated. If intent is about tracing a geo address using internet map services then authority would seek uninterrupted connectivity of internet signals, clear graphic and right verbal directives. The factors talked in this article are of two types; some are in your direct hand to monitor while others either not in hand or in an indirect way. We shall work to fit the things in this purview as finest as possible! Elaboration of sub-title of this article: Gentleman word in context of authority of a website stands for good-will or trustworthiness of a website earned through committed, continuous and consistent delivery of all presumed deliverables with time, and suit-boot is like its technical wardrobe consisted of security & privacy checks and fixes. Combination of both CONTEXTUAL TRUSTWORTHINESS and TECHNICAL ASSURANCE of a website give quality user interaction (UI) and user experience (UX), thus a complete sense of AUTHORITY. Note: Before proceeding ahead, I should remind you that this article covers around 52 check-points spread over its different segments, written by researching more than 24 references inserted at relevant places. Lexical Quality, because words and language perform: Correct grammar and spellings, consistent and understandable phrasing, to the point sentencing and clear text blocks all together make content lexicality qualitative. Otherwise to it written content may question reliability of your website. Even if the site is technically legitimate (read in technical assurance section below) and not a scam or spam, any inaccuracy in language will cast doubts on information worthiness, thereby rating it a poor source. So make sure that there is no broken language (for example English), no poorly or wrongly spelled words, no wrong grammar used, no awkward phrasing and no juggled text blocks. One more point comes in purview that never use superlative claims like ‘delivery in 10 minutes’ rather go generic like ‘fastest delivery’. A practical tip in this regard can be watching lexical style of credible sites closely. Regular Content Updates: Well regular updates shows that you were always there in user service. Brand assesses the authority: If website is a well-known trusted brand chances are that it is legitimate. For example Google, Facebook, Bing, Amazon etc. Humanize your website: Add a hint of your personality to your website through its pages such as ‘about us’ page, ‘profile’ page and even in the front page (if possible) so that users may feel that they are in good hands. Let’s take a look at the landing page of Tim Ferriss’ website. He clearly mentions about his awards, fan followings, quotes and testimonials, star ratings, own photo and call to action button on front page. He has been able to achieve this much acclaimed level of trust and loyalty through consistent exceptional and original content delivery. His site’s landing page is in real sense a fully humanized page. “Classic SEO divides itself into four quadrants based on on-site vs. off-site and relevance vs. authority“. Social Media Presence: Check if a website has its social media profile page or not. Search Network Presence: The website is at least justifiably if not with top rank, accumulated in Google searches for related keywords and market. Links with Organizations: Show links with reputed organizations such as a universirty, research lab, government agencies or any other reputed organization. Media Publication Presence: Get your content in online and offline publications such as magazines or news-papers. If your user have read about you before visiting your site, it shall always add presumed value. Being on any or all of these platforms indicates the user that you are actively online. Display Case Studies: Show up your scientific work such as case studies, it shall make users believe you are scientific. Maintain a Blog of your site: It signals the users that you are up-to-date and provide free information thus impresseses users as expert of the field. Backlinks, the highest order credibility: Credible articles and blogs should cite the source of the information clearly i.e. outbound links. And same time you should knock every door for getting inbound links indicating towards your site. Search engines pull the websites with quality backlinks in top of their SERPs. So backlinks work as the major invisible factor behind your online search appearance. Reviews and Feedback in SERP Snippet: Search Engines usually show reviews and feedback from sources unaffiliated along with website’ SERP for high-traffic websites. 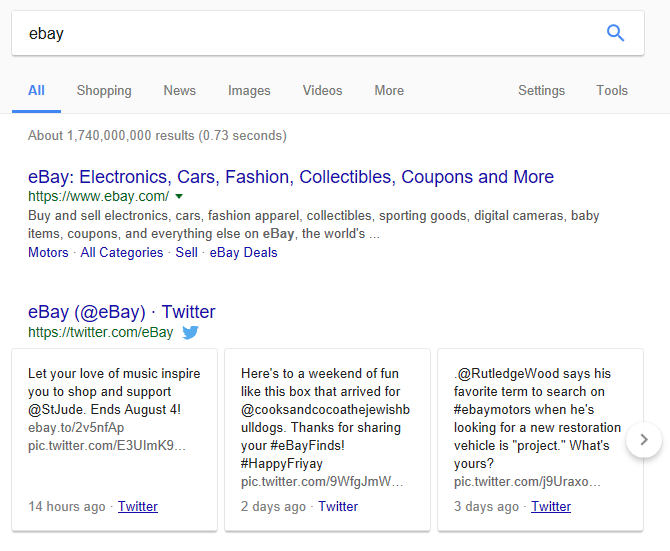 For example see in below screenshot, eBay displays its three user reviews from its twitter handle in its Google Search appearance. Backing up your statements and claims by third-party evidences, neutral experts or verified studies establish your site in hue. Having clear contact details show your sincerity: A website with a contact us form, correct address, valid phone number on its contact page (phone number even on home page) proposes users that you are easily reachable for them and they can send questions, comments, and concerns to you. A site without contact us page is a red flag of its being fake. Many counterfeit websites display seemingly authentic contact us details but not found always true so until you test them all, especially on first time interaction to any site; don’t fall in. all mean that you have encountered with either a fully fake, non-serious, unclear in their ambition or an overpromising site a minimum. “Humanize your website” by showing real images of you and your team because people don’t trust a website – they trust the people / brand behind the website”. Thus information of the author on site’ profile or about us page or a little snippet about author at the end of the article is one indication of a credible site. Markets with high urgency of human sensitivity such as finance and medical aspire for this information as a token of trust, though it doesn’t matter as such for gossip, humour, and entertainment queries of lower authority. Time-stamp means you are still there: News, research, warranty, trends and traits demand clear date mentioning. Date decides if a particular piece of information or even product is recent or fresh enough for user’s purpose. So go by the habit of including a clear date always. Note a caution here: If you can’t regularly update your website’ news section or blog then do one of the 2 things: 1) not have one, or 2) remove the dates. Otherwise with older dates in display you may be taken out of business. Consider how you accessed the website: Visiting a website by typing its URL in to address bar or getting in SERP of credible search engines like Google, Bing etc. is the safest way of landing the right website. But nowadays there are many back door push tactics also prevail, which intend to get you on a desired website (most probably to trap you in a hazardous clone) such as by sending links through suspicious email messages full of over promising and instigating texts. Tip here is that don’t trust all emails except those are from permitted or trusted source. Don’t forget to mark such emails as spam to your email services provider such as Gmail, yahoo mail, outlook etc. So this way we have pretty much covered-up about almost all aspects of contextual trustworthiness of a website, webpage, blog, landing page or targeted page prevailing in 2017. We shall now proceed for elaboration of second component of authority in context i.e. the technical assurance. SSL Certificate, padlock beside it and their colour indications: In one line SSL is about HTTPS prefix in a URL and a lock icon on its left. ‘https’ or ‘http’ is used as URL prefix in URL of every website. Out of both ‘https’ prefix is indication of technically secured site because ‘https’ can be obtained by SSL certification process only. Having SSL (Secure Sockets Layer) certificate is an assurance about the security of your sensitive information being submitted through either creating of an account on any of informational, navigational or address tracking sites; or making monetary transaction on ecommerce sites. Below screenshot shows a ‘https://’ prefix of an address bar of a URL and padlock in green. You may like to click the padlock icon to know about type of encryption used. Common phishing discrepancies of domain name: In my another write-up focused on White Hat SEO , I explain these aspects beautifully and quotes the use of underscore or space as an outdated practice and emphasize no URL should be halfway written or broken. So sites that imitate actual sites in their domain name e.g. “Faceb00k”, “G00gle” or ‘tescoo.com’ instead of ‘tesco.com’ are often marked as phishing ones and are solely inteded to trap users, thus do not trust them. Look up for the WHOIS ownership: WHOIS lookup reveals you about Registrar Company of the domain, their address, its creation date and validity period. As a conclusive tip fake sites usually live lesser than a year or few months or in some crucial cases even few weeks period. Show of credibility in domain extensions: It is about out of ‘.com’, ‘.net’, ‘.biz’, ‘.info’, ‘.edu’, ‘.gov’ or ‘.uk’, ‘.us’ etc which one to trust and up to what extent. itxdesign.com states that domain extensions like “.biz” and “.info” tend not to be credible. Uknowit seems more elaborative in its say here, it states that domain extensions such as .com, .org, and .net can be purchased and used by any individual. However, the domain .edu is reserved for colleges and universities, while .gov denotes a government website. These two are usually credible sources for information (though occasionally a university will assign a .edu address to each of its students for personal use, in which case use caution when citing). Thus be careful with the domain .org, because .org is usually used by non-profit organizations which may have an agenda of persuasion rather than education. Browser Extensions, Plugin and Add Ons: These mini applications runs on your browser, which gives you overall productivity, privacy, ratings and reviews around a website’s reputation by millions of people. Saiket Basu at guidingtech.com says that every browser worth its name like Microsoft Internet Explorer, Apple Safari, Google Chrome, and Mozilla Firefox supports extensions and add-ons. Of course, each is coded specifically for each browser. For instance, Google Chrome has its own lineup of extensions and all of them are available on Google’s Chrome Web Store. Similarly, you can find Firefox Add-ons at the Mozilla Add-ons Gallery. There are many Free browser add-ons also available out there such as WOT, Webutation, Trustpilot popular among them. Some users might check you out there. Hazardous Checks: There are many websites seen built solely for the purpose of harming your device. Many anti-virus tools if installed in your device safeguard you from such threats. Norton Safe Web by Norton (Symantec), AVG Link Scanner by AVG, McAfee SiteAdvisor by McAfee and Dr.Web LinkChecker by Dr. Web anti-virus are few to mention. Google’s Transparency Report (GTR): If in doubt, you can quickly run a website’s address through this service of Google to see its safety rating. Sites range in rating from “No data available” to “Not dangerous” to “Partially dangerous” and so on. For example, sites like WikiHow and YouTube achieve “Not dangerous” ratings from Google, whereas Reddit garners a “Partially dangerous” rating due to “deceptive content” (e.g., misleading advertising). The Google Transparency Report also provides examples of why it gave a certain site a certain rating, so you can decide for yourself whether or not the rating rationale pertains to you. Better Business Bureau’s (BBB) site to verify a website’s legitimacy: Wikihow elaborates that, “You can verify your website’s credibility by comparing the Better Business Bureau’s results with the website’s claims.” BBB is a verification process that validate your selected website toward businesses matching to your provided website. For example, if your website claims to be a marketing blog but the BBB links it to a legal service provider, take it as a scam. However, if BBB results line up with the site’s theme, you can probably trust the site. Wolframalpha is another great tool to diagnose about the safety of a website. From psychological perspective, be friendly, sincere, generous and honest in your efforts by keeping your potential users at focus always. From perspective of output of this article, after going through this research we can confidently establish that Contextual Trustworthiness and Technical Assurance of a website are two sides of same coin. Both need to be seen side-by-side for a complete authority in the manner we have pretty much tried in this article. Now it is your turn to assess my efforts and set my future course of action on this subject. Give me this much feedback a minimum so that when I sit to write its next version, let’s say somewhere in 2018; all left-out, missed or new points could be added in the updated list. CHEERS! It is very important article expressing in simple and systematic way.